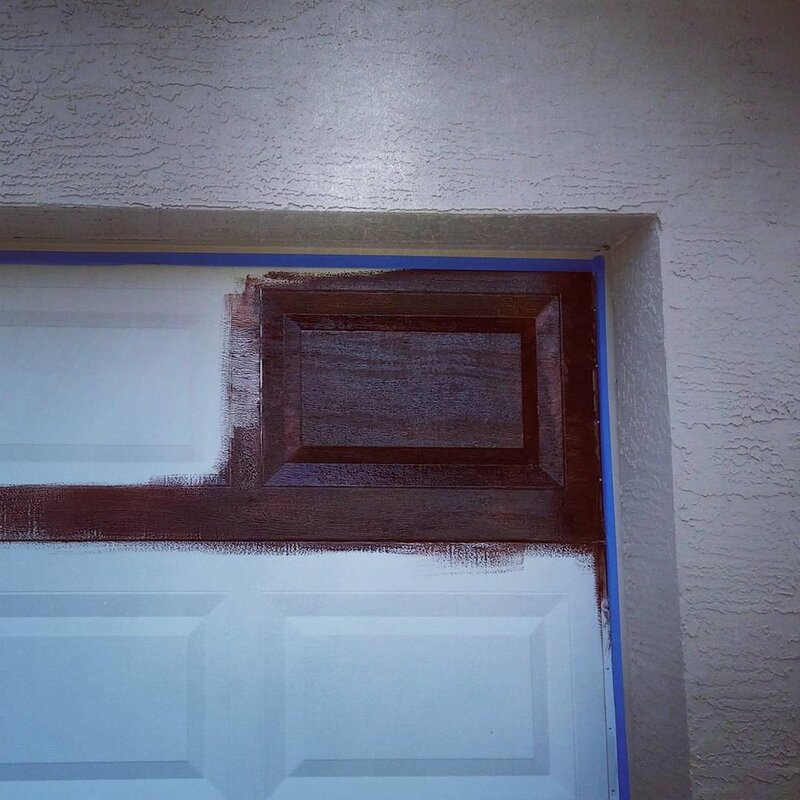 I've seen quite a few garage doors stained online and was curious to try it out on our plain white one. How hard can it be? Bought some gel stain (it's about $15-20 per quart), taped off the door trim and got going. Used a cheap brush, since I didn't plan on cleaning it off and just threw them out once dried. Gel stain went on really easy and as long as it was under 85 degrees outside it didn't run at all - much easier than regular paint. Color was rich and glossy right off the bat. The regular door was much harder than the garage one since it had no texture. And I ran out of the quart right towards the end providing the haunted house look that my wife made fun of me for about a day or two until I painted it the second coat. I noticed the paint fading on the house a bit (right side bottom) and there were a few other spots, so I ended up painting about a quarter of the house exterior to make it all look proper. And I do need to get a decent looking attic grate since mine looks like it's been chewed on(or make my own). Much better after two coats. All doors covered with two coats and walls painted, plus white columns on the front painted to match the door & roof (first 3 in the pic, last 2 are still white). Fun & easy project that only takes a few hours. I painted the house numbers over in white later. Tried adding the fake windows like a lot of tutorials show - made a template, painted them on, but it didn't look right and was barely visible, so I just stained it again. Gel stain is closer to paint so it covered it up no problem. Soc was being helpful as usual.